Figure 4.1 Ste. Croix Island was the first of France’s efforts at a year-round settlement. Known by the Passamaquoddy peoples as Muttoneguis, the site is now within the state of Maine. New France was the area nominally claimed and in some places actually colonized by France in North America. This activity began in 1605 and ended with the loss of almost all of it to Great Britain and Spain in 1763. As Louis XIV took steps to centralize authority in France and its holdings in the 1660s, the political and social structure of New France became more finely tuned and a largely homogeneous population was established. Catholic, ethnically and linguistically French, and subject to the laws of Paris and Versailles rather than local administrations, New France provides a sharp contrast to the diversity of colonial experiments in the English-speaking enclaves on the Atlantic seaboard. New France was distinct in its geography as well; rather than growing outward from a well-entrenched core, its people and its diplomacy rushed into and across the centre of the continent. At its peak in 1712, New France extended from Newfoundland to the Rocky Mountains and from Hudson Bay to the Gulf of Mexico. The extent to which New France was settled by French colonists, however, was limited to a few concentrated pockets. It is best to think of New France as an enormous zone of influence, one that was divided into five colonies, each with its own administration: Canada, Acadia, Hudson Bay, Newfoundland (Plaisance), and Louisiana. 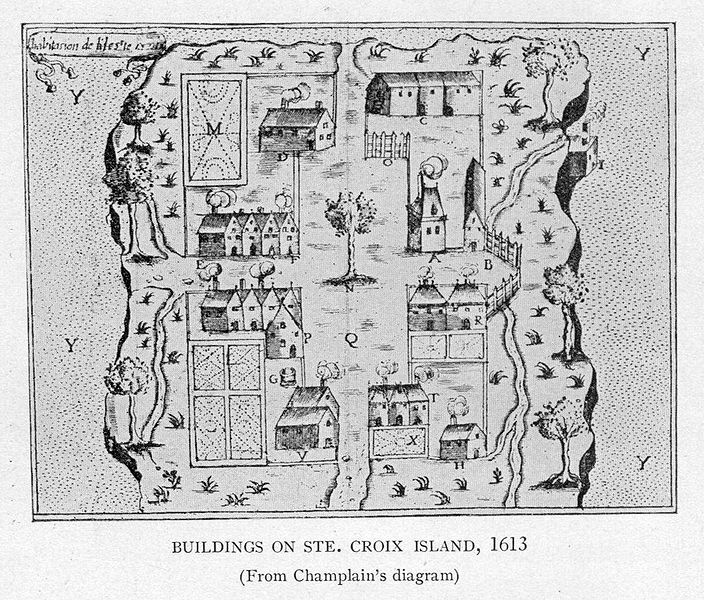 Identify, locate, and distinguish between the principal colonies of New France. Account for the growth and setbacks of the colonial enterprise. Explain the implications of an economy based on staple products. Describe the kinds of economies and societies that emerged by the mid-18th century. Assess French colonial attitudes to Aboriginal allies, enemies, and slaves. Describe the role of empire and its relationship to emergent local societies. 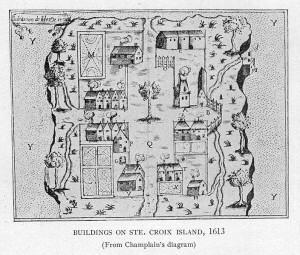 Buildings on Saint Croix Island – circa 1613 – Project Gutenberg etext 20110 by Tagishsimon is in the public domain.